I wonder if there is anybody that recognises themselves, or knows anybody in the photograph. 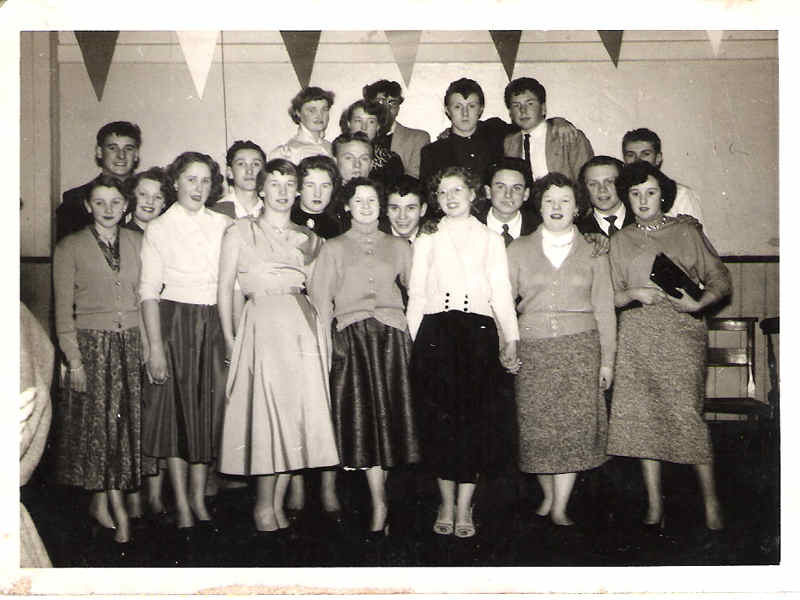 The photo was taken about 1954 at the Manor Farm Youth Club in Rock Street, Kemp Town, by Brian Marchant I think. From memory, I can name in the photo:- Maureen Miles; Pamela? Bishop; Brenda Lord; Dorothy Tully; David Warne; Bob Meacham; “Shang” Maskell; Ronnie Crosswella; Terry Groves and myself of course, Vic Bath. Perhaps somebody can add some more names and knows whatever happened to the club and any of the people in it. I lost touch with Brighton when I joined the RAF in 1958, got married, and settled in Oxfordshire where I still live. I left school (Whitehawk Seniors) Summer of 1952 and moved to Peel Road roughly the same time, having lived at 55 Rugby Place throughout the War. I knew nothing of a Manor Farm Youth Club and probably would have been too shy to even consider it. But Brenda Lord is mentioned as being in the picture. I remember her from Rugby Place and being very attractive with long silvery blonde hair. I can’t say anyone in the pic resembles her (they’re all brunettes). She had at least two brothers. The girl dead centre front row looks like Gwen Harris, again from Rugby Place and Whitehawk Senior Girls. Her two brothers were Ralph and David. Thank you Brian for your comments above. Yes, one of the girls you named Gwen in the front row I certainly remember her name now. Brenda Lord is in the back row row on the far left end, with a white blouse, that is definitely her. She was a girlfriend of mine for a while, “going out” as we called it in those days. Yes, she had blonde hair, but the photograph does not show this, the lighting in the club, the scanning of the print, its transfer and its age could have had an effect on it. Hi, as someone who is related to Maskells from Brighton I would be interested in knowing which bloke in the photo is “Shang” Maskell – thanks! In response to MM’s query above, “Shang” Maskell is the fellow in the second row, second from the right when looking at the photo, with a cigarette in his mouth. Next to me in fact, as I am on the end of that row. Manor Farm – my dad’s from there, Michael Winterbottom, and his brother Rod. Does anyone remember them? My mother was Violet Maskell, her father was George Maskell they lived in Upper Gardner Street. The two lads top right in the photograph are Ronnie Crossweller and Terry Groves. That’s correct Derek. I remember you from Maresfield Road, where we used to play ‘Hot Rice’. I used to ‘hang out there’ in the early 50’s along with your neighbours, Vic Standen (he nicknamed me ‘Bowl’) and the two you mentioned in your post. I lived in Sussex Square at that time. There was also in our ‘click’ Ray Faires, ‘Mutton’, and a few others whose names escape me at present. I now live in Oxfordshire, where I have been since being demobbed from three years in the RAF. I had to do National Service like a lot of us had to in those days. Yes I remember the youth club. I lived at 106 Maresfield Road . Alan and John Streeter? I remember playing hot rice too but does anyone remember cold rice? I knew Ronnie ,Terry, Derek and his brother Michael, Vic, and Carol Miles and Ronnie Townsend. I used to play football for the youth club.Those were the days. I used to play football for the Manor Farm Youth Club as well, I was useless, I just played to make the numbers up. I think it was Vic Standen who was captain, he was excellent, he used to play for Brighton Colts. The football club did very well, we often won our games with our score in double figures. I played at right wing and never scored a single goal, perhaps my crosses helped a lot. Hi is it possible if you could tell me who the young man is on the right hand side at the back with just a white shirt on? In answer to the post by Chambers, I am afraid I do not recognise who that fellow is with the white shirt. The fact that his face is not in full view doesn’t help.